Storm Force 10, the first race of the 2015 Cornish Road Running Grand Prix gets underway in just over a fortnight. On Sunday 18th January at 10.30am, Carn Runners will host around 500 people as they test themselves on this flat and windy ten miler. After the muddy fun of The Scrooge in December, this will be a proper test of the progress runners have made in their winter training. A look at the results from the last few years shows that Justin Thomas is currently the man to look out for. He will be looking for a third straight win, with the likes of Noel Kindon and Daniel Alsop keeping him on his toes. In the ladies’ race, the battle will most likely be for second place, as Emma Stepto maintains a seemingly unbreakable grip on title. Last year she beat her own course record and finished second overall to win the ladies’ race by over 5 minutes, recording her sixth consecutive win. Last year’s Grand Prix runners up Emma Schuck and Eleanor Davis will most likely be at the front of the chasing pack this year. Entries are available at Race HQ on the day (£14 affiliated, £16 unaffiliated), and for more info visit the Carn Runners web site (link). 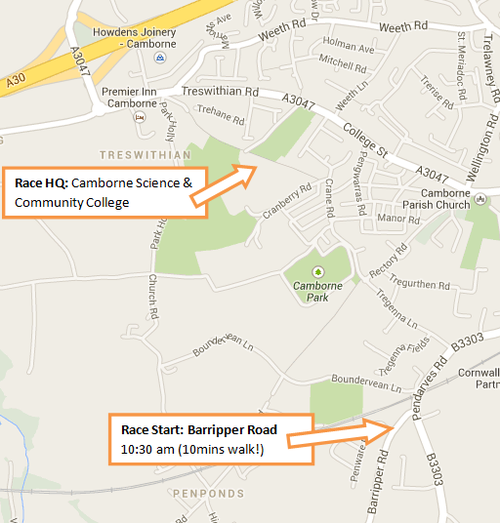 Race HQ is at the Camborne Science & Community College (see map below). Although the race finishes there, runners should note the start is about a ten minute walk away, on Barripper Road (perfect for your warm-up!). Starting on Barripper Road, runners will head out on undulating lanes through Barripper and on to Carnhell Green, then towards Leedstown. There is a short uphill section at around 4 miles, followed by a short gravel section at approximately 4.5 miles, at Leedstown. 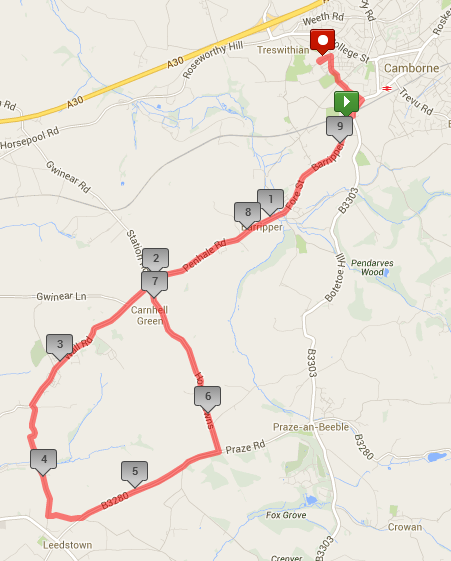 The route turns towards Praze and then back to Barripper, to join the final undulations back to Camborne. There is then a fast downhill finish back to race HQ at the college, with some tight turns, so well worth a recce. Previous story Download Free 2015 Running Calendar!